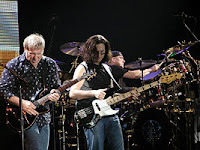 Rock band, Rush will play the Marcus Amphitheater tonight on Milwaukee's Summerfest grounds. The band totally kills me, but guys seem to like living in the past listening to hits like: Tom Sawyer, Limelight, The Spirit of the Radio, The Trees, Fly By Night, Red Barchetta, Working Man, Subdivisions, Freewill, Closer to the heart, New World Man, Farewell to Kings, Distant Early Warning, YYZ and other SUPER GREAT HITS which I personally would turn off in a matter of seconds. This should pretty much close the Marcus Amphitheater for the season. We look forward to another great summer concert season in Milwaukee in just a few short months...er..seasons. Getting back to my first thought; Rush tickets are still around town if you are free tonight.